The Biddle Hardware Company was established in 1837 by Robert and William C. Biddle, brothers that originally called their firm R. & W. C. Biddle. That name was changed to R. & W. C. Biddle & Co. after the sons of Robert and William joined the firm. Clement M. Biddle was the son of Robert and he became a partner on January 1, 1865 after working for the firm since 1861. His cousin Charles M. became a partner in 1866. 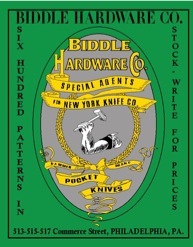 In 1866 the firm name was changed to Biddle Hardware Co. They were the first hardware house that adopted the words "Hardware Company" in their name but in fact they remained a family concern. The principals were Robert, William C., Clement M. and Charles M. Biddle. In 1872 the founding Biddles retired and the firm was taken over by Charles M. and Clement M. Biddle. That arrangement only lasted one year and in 1873 Charles bought out his cousin Clement and became the sole proprietor of the business. In 1873 Edward Knight commenced working for the Biddle Hardware Co. During the next 17 years he worked in practically every department of the company including that of traveling salesman. In 1890 Edward Knight became a partner. Two years later, in 1892, Charles M. Biddle, Jr. and Robert Biddle, 2nd, each received an interest in the firm after having started in 1898 and 1899 respectively. By the time the company issued its first general catalog in 1910, the company had been in business 73 years. Sometime within the next decade, possibly in 1919, the Biddle Hardware Co. joined with the Supplee Hardware Company and the firm of Supple, Biddle Hardware Co. was formed. SUPPLEE, BIDDLE & KING HDW. CO.
SUPPLEE, BIDDLE & STELTZ CO.
Advertisement ca.1890s Lloyd, Supplee & Walton. What eventually resulted in a major hardware concern possibly best known as the Supplee-Biddle Hdw. Co. was the result of two significant hardware distributors joining together. Those two firms were the Biddle Hdw. Co. and the Supplee Hdw. Co.
Before that merger actually took place a number of partner-ships were involved that included the name Supplee. Those partnerships were all connected in one way or another. The following includes a brief overview of the establishment and growth of the companies along with many of the labels and markings used by the companies especially in regard to the axes they distributed. Logo used in some Biddle Hdw. Co. catalogs and on some paper labels. 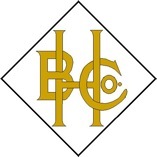 Label as depicted in the 1910 Biddle Hardware Co. catalog. The Winchester brand shown had nothing to do with the Winchester brand that emerged in 1919 in conjunction with the Winchester Stores. 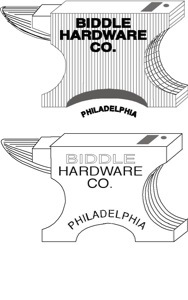 The letters in the corners indicate the label was applied to axes made by the American Axe & Tool Co.
Two versions of an anvil design were used by the Biddle Hardware Company as their logo. The anvil design was usually printed on letterheads and bill heads. Trademark No.923 registered to the Biddle Hardware Co. on July 23, 1872. Paper labels used on some Supplee Hdw. Co. axes made by the American Axe & Tool Co. after the merger. 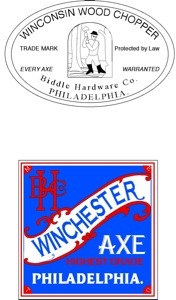 Etching used on some axes marketed by the Biddle Hardware Co.
Paper labels used on WM. 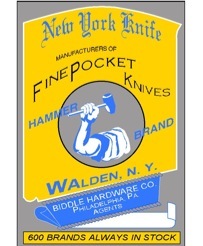 PENN axes marketed by the Biddle Hardware Co. Tops of boxes that contained stocks of various pattern knives manufactured for sale by the Biddle Hardware Co. They advertised that they sold at least 600 patterns. Lloyd Supplee was located in La Crosse, Wis. 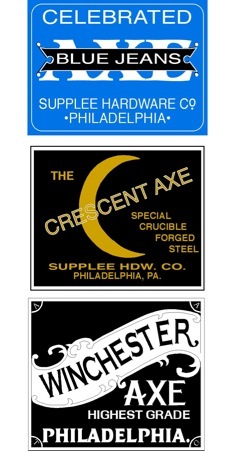 The other firms were all in Philadelphia. Symbol observed on a letterhead and used some pocket knives by the Supplee, Biddle & King Hdw. Co. The RED CHIEFTAN label was registered (#13, 825) to the Supplee-Biddle Hdw. Co. on Mar. 10, 1906 for axes, hatchets and adzes. Application had been filed on Oct. 21, 1905. On May 15, 1906, another Red Chieftain trade mark was issued to the Supplee Hdw. Co. It was designated as #52,687. 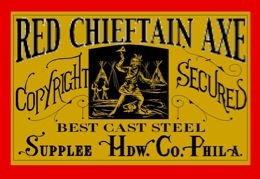 NOTE 2: There may have been some legal dispute involving the RED CHIEFTAIN and the RED WARRIOR brand or the RED CHIEFTAIN axes may have been produced specifically for Supplee-Biddle by the Mann Edge Tool Co. NOTE 1: The design in the center of the label is quite graphic in regard to the scalped figure at the Indian’s feet. It was later changed to a simpler design. 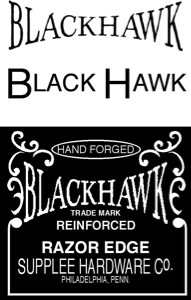 The BLACKHAWK brand and label are based on a registered trademark issued to the Supplee Hardware Company in February 1904 & Jan. 23, 1906 (#49,167). It was stated to have been in use since February 1902. Symbol printed on some letterheads and bill heads used by the Supplee Hardware Company. The CHARTER OAK U.S.A. mark was etched into some axe heads. The right mark was used on handsaws. The brand was initially registered by The Collins (Axe) Co. so they made the axes and allowed the use of the brand on other tools. The two WM. PENN brand and designs were etched into some axe heads. The two marks at the right were etched onto some handsaw blades. 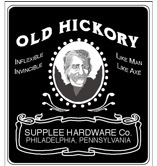 The OLD HICKORY label was used on some axe heads. The brand was registered by Supplee Hdw. Co. but it was used by others. At this point no explanation has been determined. Numerous brands and marks were used by the Supplee Hdw. Co. Some were used on axes as well as other items such as spades, shovels and scoops. GLADIATOR was used on agricultural implements and sheep sheers. Interestingly, the LIBITY BELL logos on tools depicted in catalogs in the late 1800s show the crack in the bell on the right side of the bell. Advertisements from the teens show the crack just to the left of center. 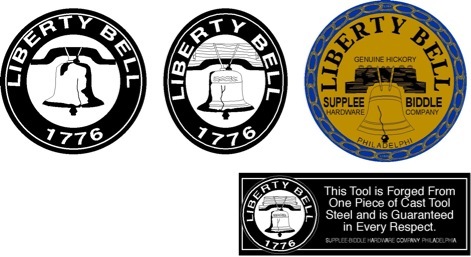 A full size page representation used for research, along with large logo examples, show a more detailed representation of the bell with the crack more to the left side.